The Glass House Mountains, just an hour north of Brisbane, are a fantastic tourist attraction. Most people stop on their way to the Sunshine Coast, go to the lookout, take some photos, then keep going. 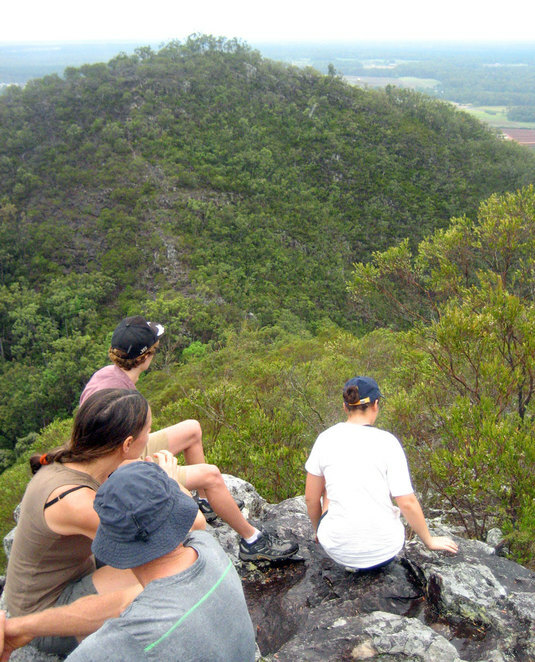 However the Glass House Mountains area includes views, hikes, climbs, great cafes and much more. The Glass Houses were named by Captain Cook as he sailed down the coast. From the sea he could see the mountains and they reminded him of the chimneys for the glass houses in his home town: hence the name. Mathew Flinders was the first European to explore the area in 1799 and climbed Mt Beerburrum. There are various Aborigine stories and legends about the glass house mountains. 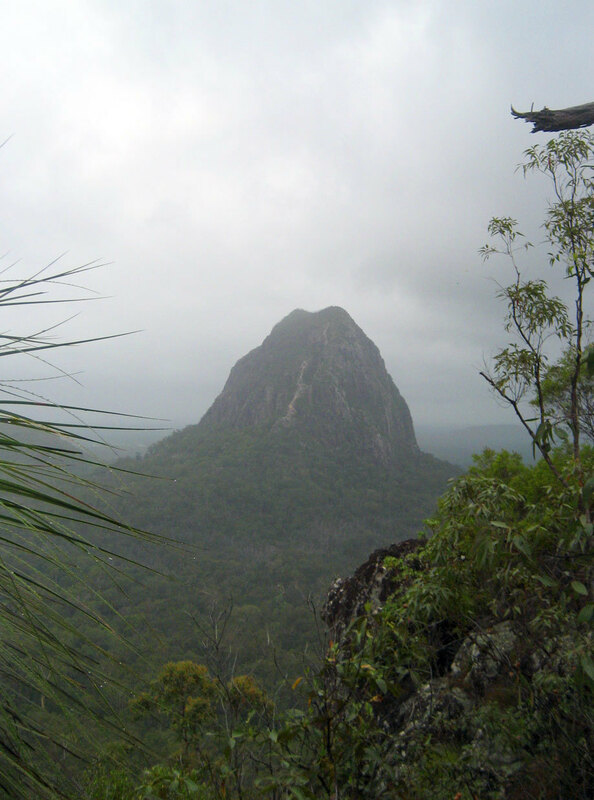 The Glass House mountains are a family with Tibrogargan being the father and Beerwah the mother. They had many children which are all the other hills. Coonowrin being the eldest and Tunbududla and Coochin both representing twins. The Aborigine name for Wildhorse Mountain translates as Round, because he was fat. He is far from the rest of the family because he loved paddling in the sea. Tibrogargan creek is formed from the tears that the father weep when Coonowrin, through cowardice, failed to help his family in a time of need. 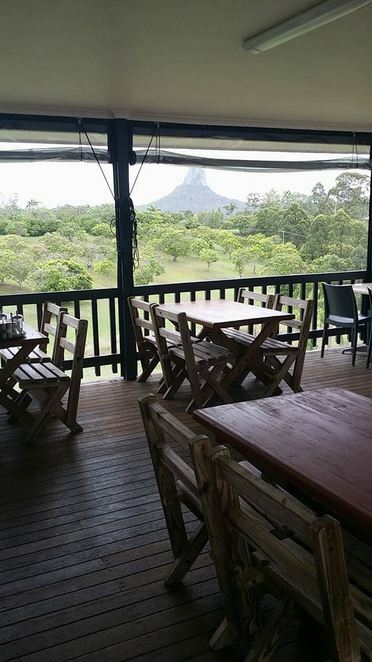 The Glass House Mountains is a nice place to stop on the way north to the Sunshine Coast or the Maleny Region, as it is just a diversion off the main highway. If you plan to do this, there are a few essential places to visit as you pass through. 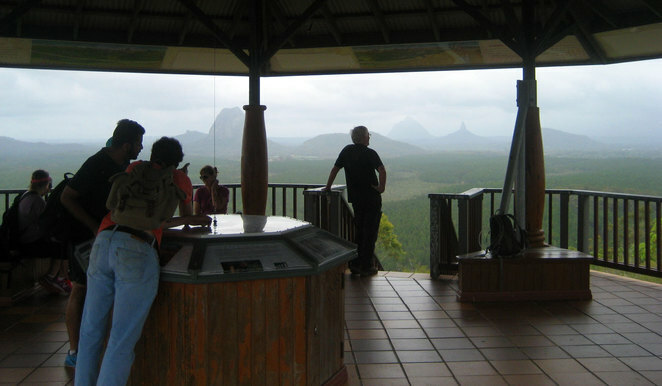 The essential place to go in the Glass House Mountains is the Glass House Mountains Lookout. The lookout has views of all the hills along with information about each hill. There is also a short walking track and electric barbecues. The place to stop for food is the great Glass House Mountains Lookout Cafe. Enjoy coffee, a snack and a meal while enjoying the view. You can also head into the Glass House Mountains township for more cafes and restaurants. 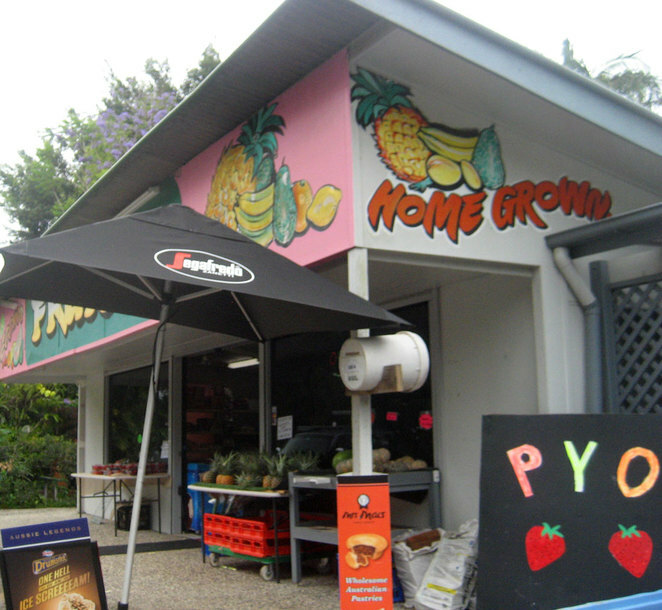 I actually like to divert through the Glass House Mountains on the way home so that I can pick up some locally grown fruit and vegetables. While there are several spots, my favourite is Vecchio's Cafe and Fruit Shop. A lot of the fruit and vegetables sold here are actually grown in a patch of land out the back of the cafe. You can even pick you own strawberries when they are in season. If you are more active then there are lots of options. In this section we are going to look at the easier activities that nearly anyone can do. Other than the hill tracks there is really only one walking track in the Glass House Mountains. Actually it is two tracks that join together. The 3.2 km Tibrogargan Circuit and the 6 km Trachyte Circuit. By joining the two together it is about 7 or 8 kms in total. The Trachyte circuit includes a lookout with decent views. 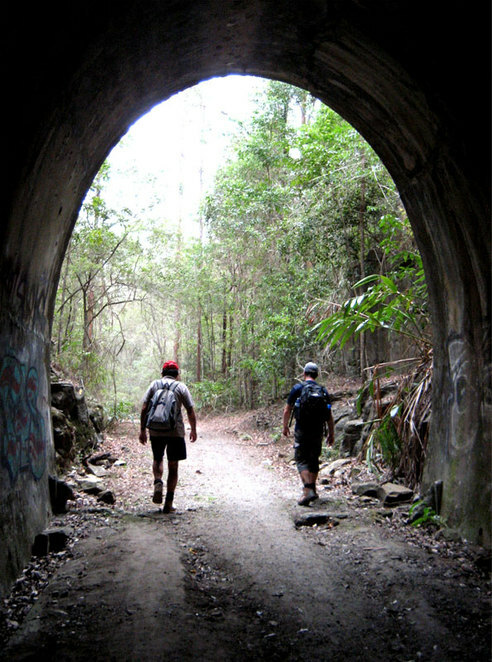 There is also the possibility of walking about 8 km to the start of these tracks from Beerburrum Train Station along various bush tracks. You can find track information on topographical maps downloadable from Qtopo. An alternative lookout to the Glass House Mountains Lookout is the one on Wild Horse Mountain. This is a bush fire watch tower and gives true 360 degree views. The path up is actually a paved road, but there is no public access to this road but it is a short but steep walk up the road. As the only hill in the Glass House Mountains that is on the eastern side of the highway, it provides a complete panoramic view as well as views to the coast. This is the hill and lookout that is best visited on the way back to Brisbane. 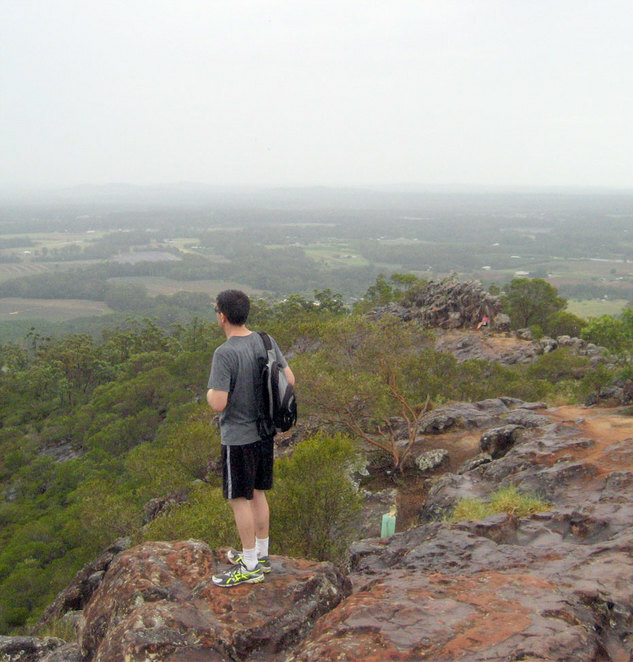 Of course if you are visiting the Glass House Mountains then you will want to tackle some of the hills. There are a number that are well worth doing and only require a reasonable level of fitness. Obviously Wild Horse Mountain is an option, but Mt Ngungun is the best walk in the Glass House Mountains. It is uphill all the way, but it is not challenging in any way. There are exposed cliff edges at the top but it in no way feels dangerous. Another little hill worth tackling is Mt Coochin. The way up the east peak is steep but not a problem for anyone. The west peak requires a scrambling up a rocky path. Both peaks provide great views. The Glass House Mountains can be a great location for the adventurous. The obvious challenge that appeals to most people are some of the challenging and interesting hills. 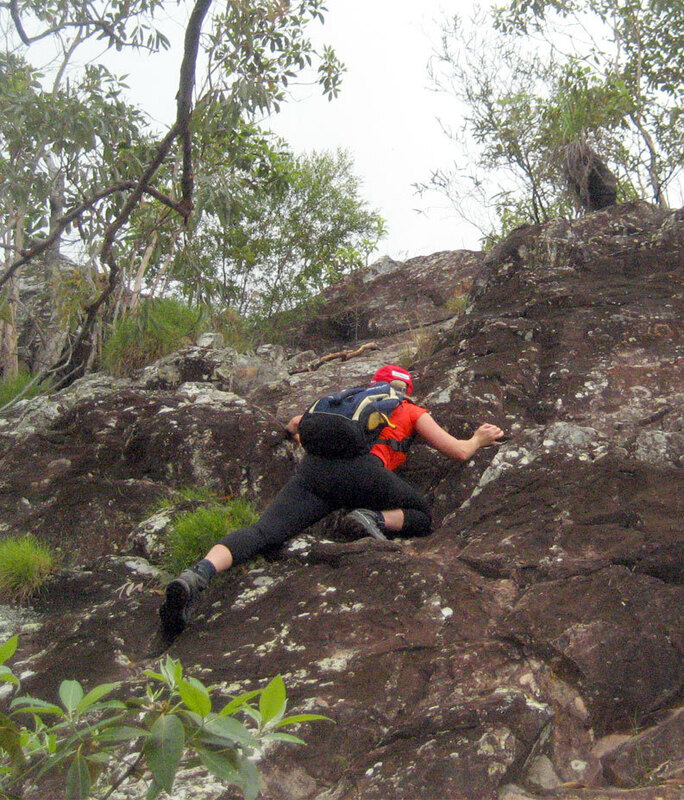 The west peak of Mt Coochin is a fun scramble, but the easiest adventure is Mt Tibberoowuccum. This 220 m high hill is a steep walk up. The real fun comes ascending the last section to the rocky dome that forms the peak of the hill. Then of course there is the hill that everyone wants to climb: Tibrogargan. To ascend this peak you don't need any special equipment or climbing skills. However the track is steep and the final section is a long scramble up the rock face. Not necessarily difficult, but you want to be fit and have no fear of heights. After the tourist track up Mt Beerwah was closed by a landslide, all hiking and climbing of this peak has been banned with no plans to reopen it. There is a non-tourist track up to the peak. However if you are caught on this track heavy fines apply. The two main peaks for non-technical rock climbing, that is climbing using ropes and equipment, are Tibrogargan and Ngungun. Unfortunately Beerwah and Coonowrin are closed because of the unstable rock faces. If you join a rock climbing or abseiling tour, then they will usually do this on Ngungun. Ascending Ngungun is a 30 to 40 minute walk, and then it is just a quick drop down sheer cliffs on the other side. This is why it is such a great abseiling location. Rock climbing companies will ascend the cliffs here as well. 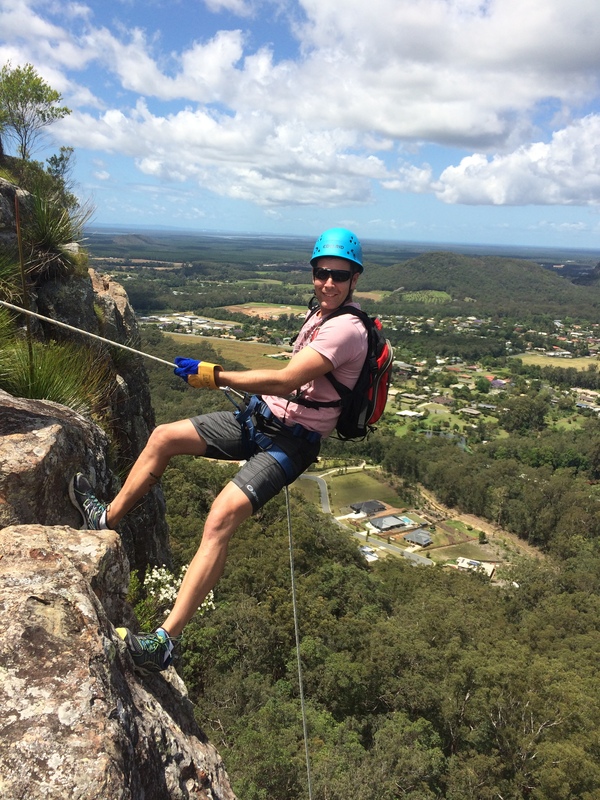 There are a number of companies that operate abseiling and rock climbing tours in the Glass House Mountains such as WorthWild. It is worth searching online for the tour that suits your schedule and provides the adventure that you are looking for. Many people climb the mountains independently of any groups. Check the National Parks website for more information for which hills are open to rock climbing and abseiling. 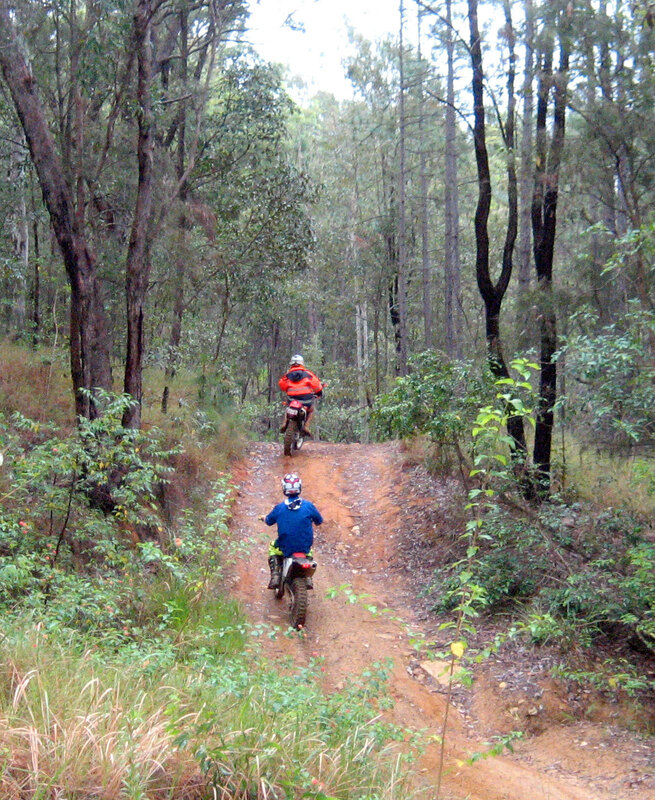 Mountain bikers will find a lot to like in the Glass House Mountains. There are a number of alternative routes and many mountain bikers do loops that involve riding on quiet country lanes, fire trails as well as specially formed tracks. The Sunshine Coast Council has a track map for mountain bike trails and includes a suggested Glass House Mountains Circuit. Be aware that you will be sharing some trails with 4WD's and trail bikes. For downhill mountain biking there is a track at Hennessy Hill used for downhill races. The area is also crisscrossed with various fire trails and multi-use dirt roads. These are not the sort of trails that suit city 4WDs or soft roaders but require real offload vehicles. My limited experience of these roads is that they are narrow and you need to share them with a range of other users. However they are popular with people who want to get on the dirt by motor power. 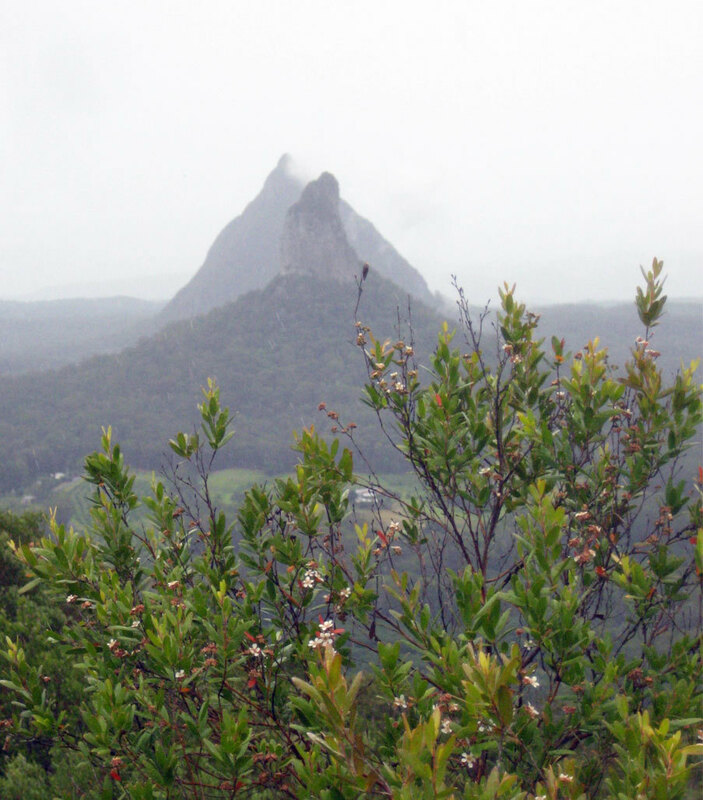 The Glass House Mountains can often be visited as part of a trip to somewhere else, usually the Sunshine Coast or Hinterland. However there are also a number of interesting locations near to the Glass House Mountains. One interesting little stop is the Dularcha National Park between Mooloolah and Landsborough. The main feature of this bushland area is walking through the 100 year old train tunnel. Another stop is the Ewen Maddock Dam where you can swim, kayak, hike and mountain bike. 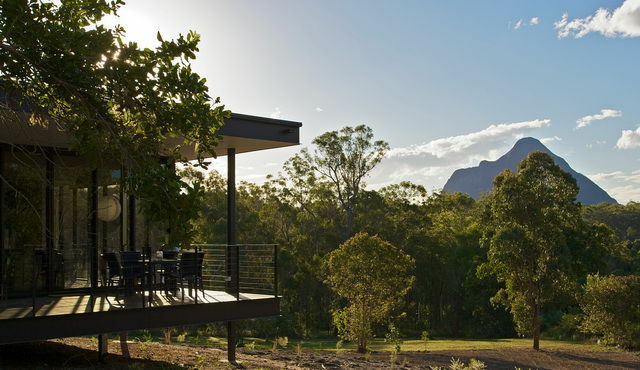 You might even consider staying overnight at the Glass House Mountains. The choices are limited but surprisingly good. Much of the accommodation around the Glass House Mountains could be described as retreats, lodges or cottages. Find a place on wonderful grounds and simply relax without even getting off the grounds. Glass on Glasshouse has great cottages with great views. They also have fireplaces for winter. They are also next door to the Glass House Mountains Lookout Cafe. The Glass House Mountains Ecolodge provides rooms in a beautiful building with a shared kitchen in a restored railway carriage. Crookneck Retreat has cottages set on a 10 acre orchard farm. There are a number of places to camp in the area. The Coochin Creek camping area can be booked through the National Parks website. With good creek access and not far from a boat ramp, this is a great location for people interested in fishing or boating. The commercially run Glasshouse Mountains Camping Ground has hot showers, a laundry and powered sites. It is also in a more central location.